Boxer Dogs - The Boxer is a breed of stocky, medium-sized, short-haired dog with a smooth fawn or brindled coat and square-jawed muzzle. Boxers have very strong jaws and a powerful bite. They are part of the Molosser group of dogs, bred from the extinct German Bullenbeisser and the English Bulldog. The character of the Boxer is of the greatest importance and demands the most careful attention. He is renowned for his great love and faithfulness to his master and household, his alertness, and fearless courage as a defender and protector. The Boxer is docile but distrustful of strangers. He is bright and friendly in play but brave and determined when roused. His intelligence and willing tractability, his modesty, and cleanliness make him a highly desirable family dog and cheerful companion. He is the soul of honesty and loyalty. He is never false or treacherous even in his old age. This information is licensed under the GNU Free Documentation License. It uses material from the Boxer article on Wikipedia.org. 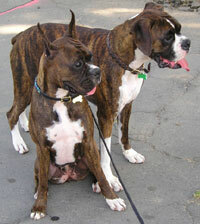 Boxer Breeders - Advertise your kennel puppies and dogs here.